Moist and flavorful inside and crunchy outside. These Cinnamon Crisps are so good. In a large bowl, dissolve yeast in warm milk. Add the sugar, shortening, egg, salt and 2 cups flour; beat on medium speed for 3 minutes. Stir in enough remaining flour to form a soft dough. Turn onto a floured surface; knead until smooth and elastic, about 6-8 minutes. Place in a greased bowl, turning once to grease top. Cover and let rise until doubled, about 1 hour. Combine filling ingredients; set aside. Punch dough down; divide in half. On a floured surface, roll each portion into a 12-in. square. Spread filling over dough. Roll up tightly jelly-roll style; pinch to seal. Cut into 1-in. slices; place on greased baking sheets (four slices per sheet). Cover with waxed paper; flatten slices with palm of hand into 3-in. circles. Cover and let rise until doubled, about 30 minutes. Cover with waxed paper and flatten or roll into 5-in. circles. Brush with butter. 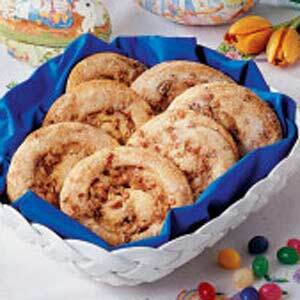 Combine the sugar, cinnamon and pecans; sprinkle over butter. Cover with waxed paper; roll or flatten again. Discard waxed paper. Bake at 400° for 10-12 minutes or until browned. Serve warm. Yield: 2 dozen.